Vehicles can't just 'stop dead' - they are big and heavy, and if someone steps in front of them the driver may have no chance of stopping in time. Stopping distance depends on the speed of the car click on the above graphic to see an enlargement of it. That is why we have speed limits - the more likely it is for a driver to have to stop, the lower the speed limit. A road with houses on it normally has a 30mph limit but a motorway has a limit of 70mph because there should be no one trying to cross it. during the time it takes for the car to stop once braking has started the car travels the braking distance. 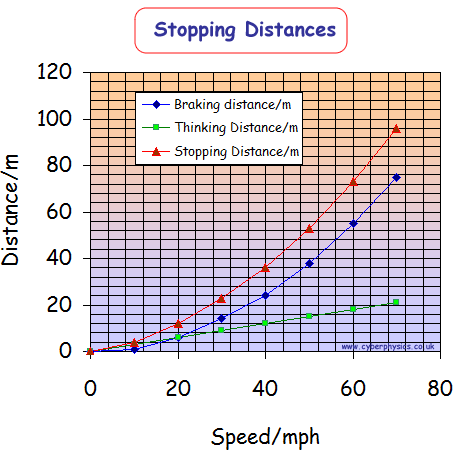 What can increase stopping distances? The car (worn brakes, extra weight, bald tyres etc) Note that for AQA syllabus 4403 the examiners limit 'poor condition of the car' to the car's brakes or tyres. age - your thinking processes slow as you approach old oge. Braking distance is the area under the graph of the velocity/time graph showing the deceleration of the vehicle against time. If you double the velocity at which you apply the brakes you will double the time it takes to come to a standstill.... but the distance you travel in that time will go up by a factor of four! So, the faster the vehicle is travelling the greater the actual braking distance is compared to the thinking distance by the square of the factor that increased the speed - it is a squared relationship between speed and distance.. Thinking distance is the time the vehicle travels in the reaction time - the time it takes to realise you have to stop! Let us say the reaction time (time between you realising you need to stop and you actually hitting the brake) is 0.5s. At 20 m/s (about 44 mph) the car will travel about six metres before the brakes are applied. At 40 m/s it would be twice as far... the thinking distance is directly proportional to speed. The stopping distance is the sum of the two factors. The graph above shows this. Note how the importance of braking distance increases with speed. If you are travelling very fast not only will the vehicle travel a long way before you realise you have to apply the brakes - but the imcreased momentum of the car will mean that the brakes have to be applied for longer to bring the car to a standstill. Figures in the Highway Code are for an average vehicle in average conditions. It is important that you understand the limitations of your car and your own reactions when you consider the speed you travel at. Not being able to stop in time can cause someone's death or serious injury.